Bring the action of Super Mario to your room with these eyecatching Mario Brothers wall decals! Featuring Mario, Luigi, Bowser, Yoshi, and many of your other characters from this classic gaming universe, these stickers are the easiest way to dress up a bedroom or game area. Because RoomMates are removable and repositionable, you can take your time sticking these decals to any flat surface, creating your own scene and adjusting it as you please. 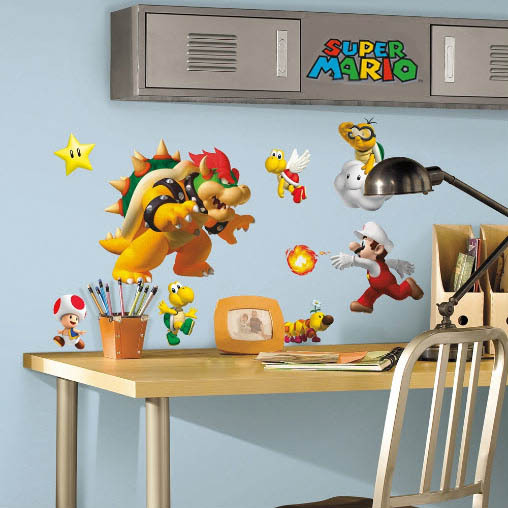 For more Nintendo fun, look for the New Super Mario Bros. Wii wall decals, or the giant Bowser wall graphic. • Decals range from 2" x 2" to 9" x 10"